WILL RENISHA MCBRIDE’S FAMILY GET JUSTICE IN CASE AGAINST HER KILLER THEODORE WAFER? 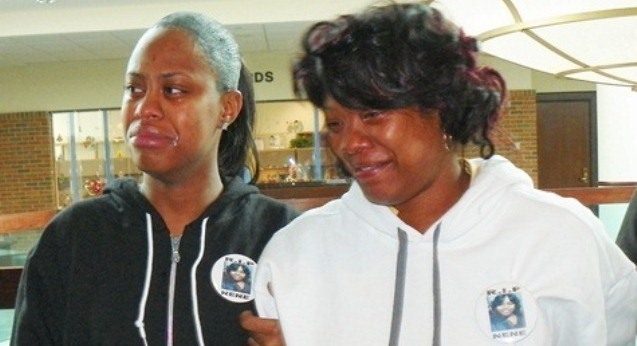 Renisha McBride’s mother Monica McBride (r) and sister grieve after preliminary exam victory against her killer Theodore Wafer Dec. 19, 2013. 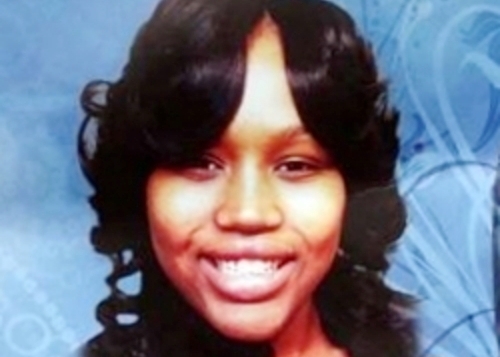 Renisha McBride, 19 when shot to death by Theodore Wafer, 54. DETROIT—Renisha McBride’s mother Monica McBride sat quietly crying and rocking slightly side to side, while her father Walter Ray Simmons at one point leaned over and put his head in his hands, during a motion hearing June 20 on the second-degree-murder, manslaughter trial of her killer, Theodore Wafer. Dearborn Heights resident Wafer, 54, sat in the row behind them with a smug smile on his face before the case was called, in front of Wayne County Circuit Court Judge Dana Margaret Hathaway. Wafer admittedly opened his locked, solid front door and used a 12-guage shotgun to shoot 19-year-old McBride in the face as she stood on his porch in a light blue hoodie, unarmed and evidently dazed after an automobile accident half a mile away. 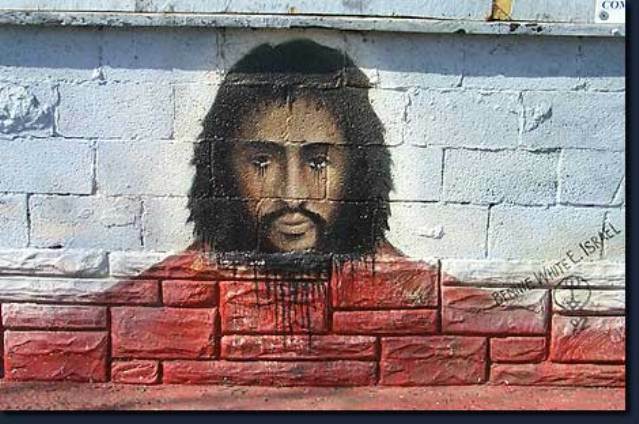 Many have compared the killing of the young Detroiter to that of Trayvon Martin in Sanford, Florida, contending racism was at the root of both killings. 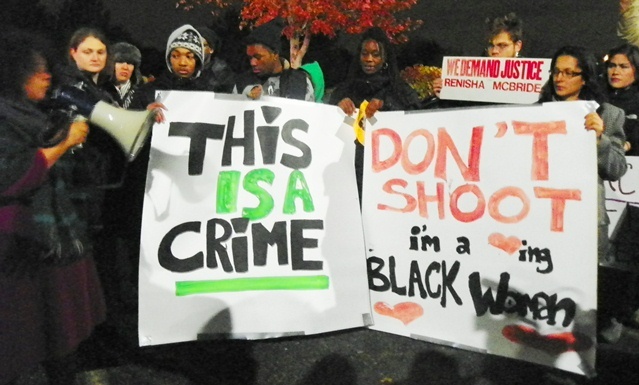 Rally for justice for Renisha outside Dearborn Heights police HQ Nov. 7, 2013. 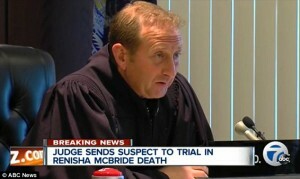 Wayne County Circuit Court Presiding Judge Timothy Kenny earlier granted a defense motion to recuse the first judge selected, Judge Qiana Lillard, who is Black, on a claim that she had ties with members of the Prosecutor’s office. Kenny is a member of the ultraconservative Federalist Society. Wayne Co. Circuit Court Judge Dana Margaret Hathaway. Judge Hathaway heard five motions filed by the defense and prosecution, with remaining motions to be heard Thursday June 28. “The jury pool’s minds have been poisoned by arguments that aren’t the facts,” Wafer’s defense attorney Cheryl Carpenter contended, arguing for a jury questionnaire to be sent out prior to the trial opening July 21, 2014. Hathaway denied the motion, ruling that it would duplicate “voir dire” questioning of the jury in person. She granted a motion by the prosecution in which the defense concurred, to have a jury pool of at least 200 instead of the 50-60 usually empaneled. The trial is expected to last three weeks and include at least 35 witnesses. Wayne County Assistant Prosecutor Terry Anderson argued strongly against an unusual defense motion to have their expert witness, Dr. Werner Spitz, testify immediately after Wayne County Assistant Medical Examiner Kilak Kesha. Kesha gave lengthy testimony during Wafer’s preliminary exam that Wafer “pulpified” the teen-ager’s brain, from a likely distance of three feet, with numerous shotgun pellets, shooting through a screen door. Theodore Wafer during earlier arraignment on the information. Judge Hathaway discounted a defense argument that Spitz’s time was constrained due to the limited availability of his office manager, who Carpenter said accompanies him everywhere. 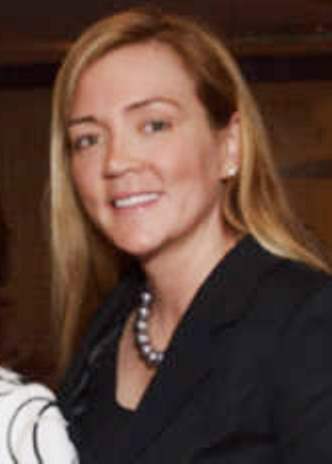 Judge Hathaway said she would rule on the motion at the hearing June 28. Spitz, now 88, is a world-renowned forensics pathologist but did not participate in the initial autopsy. Judge Hathaway granted the prosecution’s motion to admit video/audiotapes and transcripts of three 911 emergency calls, two from Carmen Beasley of Detroit, who called 911 after McBride’s car crashed in front of her house, and the one from Wafer after he shot the teen. 20th Circuit Court Judge David Turfe, who bound Wafer over on all charges. The prosecution also moved to admit audio/videotapes and transcripts of Wafer’s conversations with Dearborn Heights police while he was in their car after the shooting, and of a statement he made to them at their headquarters that night. Carpenter objected to admission of the transcripts. 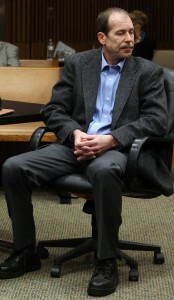 Anderson said the prosecution would likely use the evidence to impeach Wafer if he testifies. The prosecution objected to the admission of the police headquarters videotape during the preliminary exam on the basis that Wafer himself was present and could be cross-examined. Twentieth District Court Judge David Turfe agreed, and barred the showing of the videotape at that time. Death house: Theodore Wafer’s residence in Dearborn Heights. She claimed the transcripts would not show the fear in his voice. Then she asked that the jury only review any tapes in the courtroom itself, not the jury room. Judge Hathaway admitted both the transcripts and audio/videotapes. 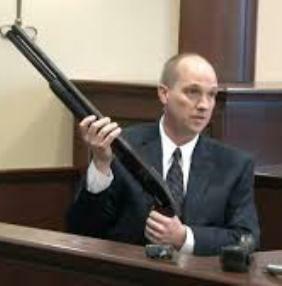 Gun expert with shotgun used to kill Renisha McBride testified at preliminary exam it could not be fired accidentally. 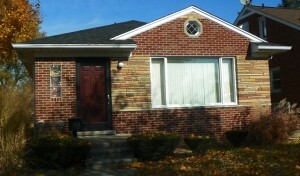 Daily media coverage of the hearing focused largely on Carpenter’s claim that Wafer feared for his life, including a Detroit Free Press headline, “Dearborn Heights porch shooter’s defense says case is all about fear.However, testimony at the preliminary exam showed that Wafer had to go into a back bedroom to get his shotgun, return to the front door, open it, and then shoot McBride in the face although there was no evidence she was armed. In binding McBride over on charges of Second-Degree murder, Manslaughter – Death By Weapon Aimed with Intent But Without Malice, and Felony Firearms, Judge Turfe questioned why Wafer didn’t call 911 BEFORE opening the door if he feared for his life. Wayne County Prosecutor Kym Worthy announces charges against Wafer Nov. 15, 2013. Assistant Prosecutors on the case are (second from left) Terry Anderson and Danielle Hagaman-Clark. Wayne County Prosecutor Kym Worthy had to order the Dearborn Heights police, who first released Wafer without charges, to do a more thorough investigation of the case. They did a second crime scene review Nov. 11, during which they discovered a key piece of evidence, the perforated front door screen, in Wafer’s basement. To date, Wafer has not spent a day in jail for McBride’s killing, despite the fact that bond is not normally issued in such cases. Second-degree murder is a capital charge carrying up to life in prison. 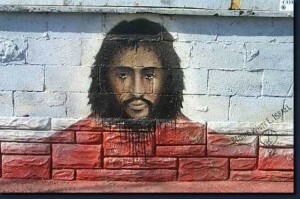 Malice Green painting by Benny Israel at the site of his death, 23rd and Warren in Detroit. Next week, motions will include one for a change of venue from Wayne County due to the defense’s claim that publicity on the case has featured charges of racism. Since the abolition of Recorders’ Court in 1999 by the state legislature, however, the majority of Wayne County jury panels have been white. Out-state legislators voted to abolish the court, which drew its jurors and judges solely from Detroit, in the wake of a Recorders’ Court jury verdict that two white police officers, Larry Nevers and Walter Budzyn, were guilty of second-degree murder in the 1992 beating death of Malice Green, a Black Detroiter. 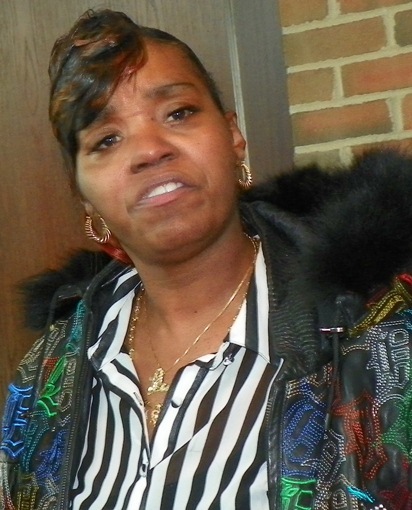 Renisha McBride’s aunt Bernita Spinks at preliminary exam Dec. 19, 2013. The defense is additionally moving to admit evidence about crime statistics in Wafer’s Dearborn Heights neighborhood, and text messages, photos, and school records of Renisha McBride. The defense claims they show McBride, who had never been convicted of any crime, had an aggressive side.